You had plans for the ideal dinner – a golden brown pork roast, roasted red potatoes, and a fresh green salad. But 90 minutes into the preparation, and the pork roast hasn’t finished cooking; in fact, it’s not even browned. Those ideal plans just turned into an “order in” night. That’s when you know it may be time for a new oven. The convection steam oven browns meats, sautés vegetables and can even fry. Meals that took multiple appliances, pots and pans can all be prepared in the one combi oven without flavor transfer. In addition, your food cooks in less time and without added oil or fat, so it’s healthier yet still flavorful with all the nutrients and, of course, the taste. In fact the steam plus convection technology can fully cook a turkey in 90 minutes, while a regular convection may take up to three hours. Models like the Wolf Brand convection steam ovens deliver precise control with a variety of steam, convection, and combination steam and convection cooking options. Unique technology can sense the amount, size and shape of food once a pre-programmed mode is selected. While cooking, it also monitors the time, temperature and environment. The guesswork is eliminated and the food is amazing. 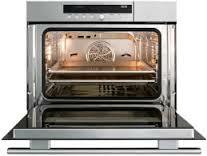 So how do you find the right convection steam oven for you? Installation: Convection steam ovens are available in a several dimensions from 21 ¾” wide to 30” wide. For smaller models, additional trim kits are available for purchase. Another consideration is mounting. Several models tout flush mounting, giving your kitchen a clean, sophisticated look. Capacity: Interior capacity can determine whether or not that brisket will fit into your oven. Here too, different brands offer a variety of interior capacities from 1.1 cubic feet to the largest at 1.8 cubic feet. Ease of Use: The combination of steam and convection cooking is not the only technology these ovens have. Pre-programmed cooking modes match with different types of foods, giving you the proper temperature, humidity and cooking time. Depending on what you’re looking for, most brands offer anything from four pre-programmed modes to 40. Maintenance: Not that your new oven is going to have an issue anytime soon, but it’s always important to know a reliable, trustworthy repair company like C&W Appliance Service, a factory certified Sub Zero Wolf brand service provider in Dallas/Fort Worth. Our skilled service technicians can handle any of your future oven repair needs. With a convection steam oven, every night can be an “eat in” night with healthy, amazing food in less time and less hassle.